Personal update: we have moved into our own house! I’ve been busy watching two kids and setting up the house and holidays, and this blog will be updated only occasionally until further notice (if I do end up getting an academic job I’ll go back to biweekly posting, but for now we’ll go with bimonthly-ish). That said I have two things I want to share with you: how to do payroll for a nanny yourself so you don’t have to pay a payroll company nor spend 5 hours looking up IRS publications etc. like I did (and *still* mess up and owe the nanny $100 more than expected and the government less than expected), and my favorite memorized recipes. I’ll do the nanny post separately, here are some recipes off the top of my head that are always hits. Biscuits and gravy, blog post here. Make biscuits. 1 lb sausage, cook. 2 TB flour, toss. 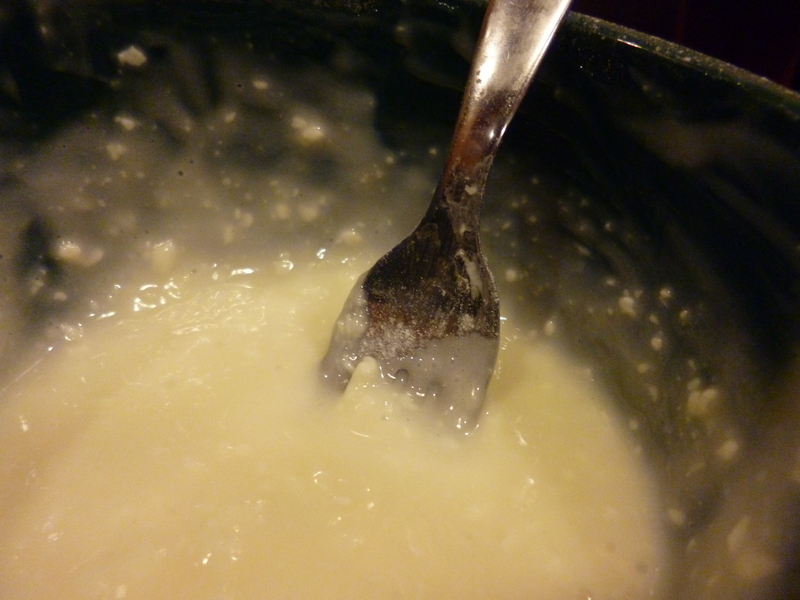 3 C milk, stir until gravy. Lots and lots of black pepper. Banana cinnamon rolls, blog post here. 350-375 degrees, 2 TB butter in pan. Crescent roll dough, butter, banana, cinnamon sugar. 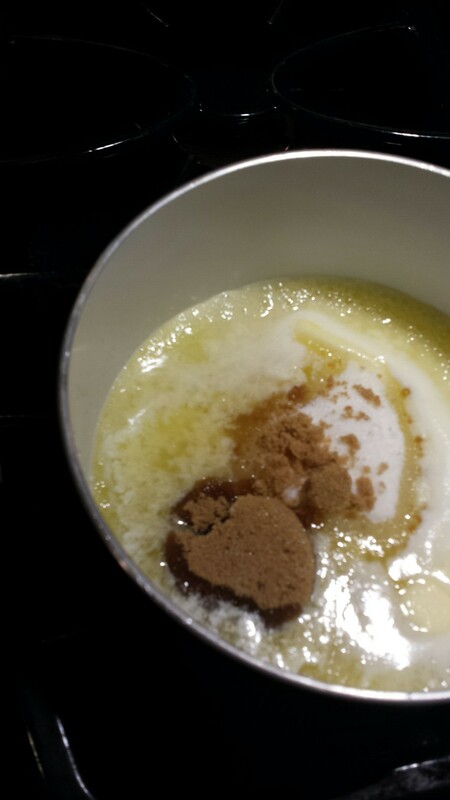 Sprinkle brown sugar on bubbling butter. 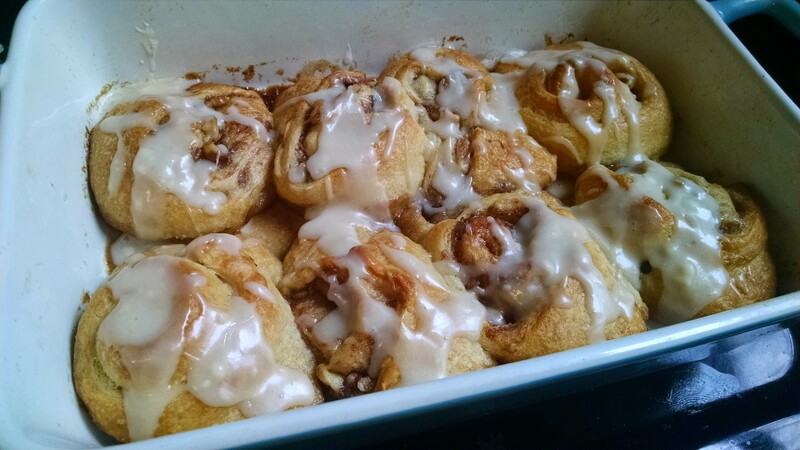 Roll up dough, cut into cinnamon rolls, put on brown sugar butter, bake 10-15 minutes. Bacon clam sauce. Cook bacon (2-6 strips, chopped), add garlic (2-6 cloves), add canned tomatoes (1-2 cans), simmer. Eventually, add can of clams with juice, cook briefly. Serve on spaghetti, stir in parsley if desired. I’m making this while IRONing out the details of this post. Tonight’s foreCAST: delicious pasta! Shakshouka. Cook onion, garlic, jalapenos. Add canned tomatoes, lots of cumin, simmer. Make room for eggs, poach in tomato sauce. Serve with pita and hummus. BLT. After cooking bacon, toast your thick bread IN THE BACON FAT. Then the best tomatoes, mayo, lots of lettuce, avocado. Grilled cheese. Spread mayo on both sides of both pieces of bread before grilling. 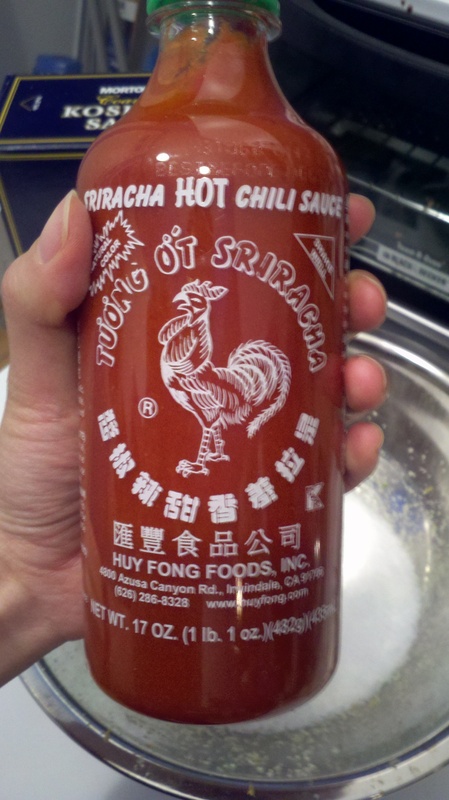 This will change your grilled cheeses. Pork with mushroom sauce, this is from the Campbell’s soup label. Salt pork chops, brown in oil. Take out, cook onions, garlic, mushrooms. Add can of cream of mushroom soup some milk, and pork chops back, simmer until done. Serve with rice. Salsa chicken. 1 jar of salsa, pour on chicken pieces (frozen is ok). Cook in crock pot. Serve on rice or in tacos, or in quesadillas, etc. Root vegetable soup. 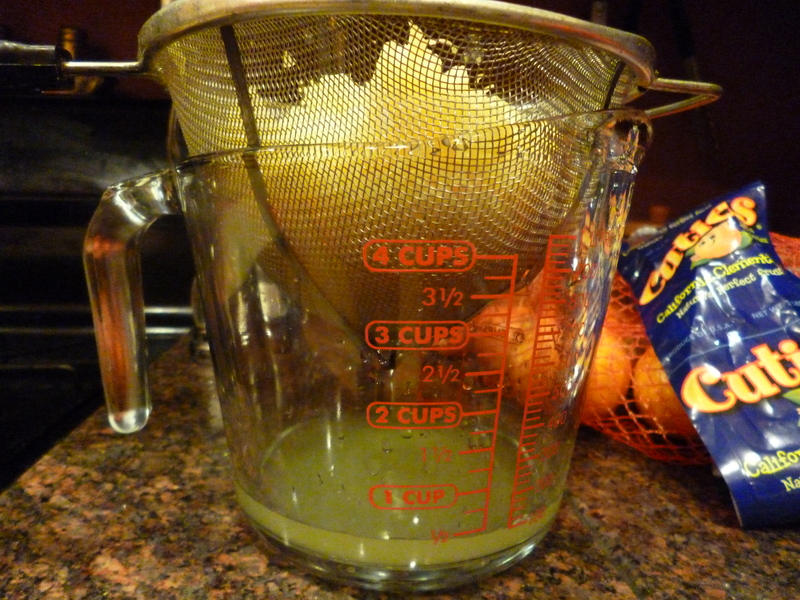 Onion, celery/carrot if you have them, garlic/ginger if you want in oil. Add your root vegetable (butternut squash is great, carrots are also great) and enough stock (chicken, veggie, or water) to just cover. Simmer. Puree. Add: curry, ginger, pepper, cardamom, some kind of spice. Serve with yogurt or sour cream. Kale or collard greens or rau muong, blog post here for rau muong. Garlic, olive oil. Kale, 1/4 c water, cover, 5 minutes. Add balsamic or apple cider vinegar, plenty. Ga kho, blog post here. Onion, garlic, ginger in oil. Cut up chicken pieces. Fish sauce, coconut water or soda. Braise. Three-ingredient peanut butter cookies, blog post here. 1 c peanut butter, 1 c sugar, 1 egg. Make into cookies, bake until done. Strawberries, sour cream, brown sugar. Dip. Thank you for reading my blog and being part of my e-life for the past several years! And if this is your first time, thanks for stopping by! This blog has been a lot of fun and a great source of pride for me. On days when I burned the cookies and forgot what a determinant was, I could still point to this blog and say look, I did something! Here’s a treat for you, a picture of my baby. You may know from Twitter that I think about and read about social justice-related things a lot. I’ve been quite stricken this week about a certain, horrible thing that’s happened, and I don’t have words/am very overwhelmed right now to write about it. So instead we’re going to chat about trifling things today, specifically, trifle, which is a delicious combination of pudding and cake and whipped cream and sometimes other stuff (fruit). Banana pudding is basically a trifle, so you know trifle’s gonna be awesome. Last week was my birthday, so I decided to throw a little party and make a cake. We didn’t actually want to be social for several hours, so it was a combination social hour + 3 hours of board games, and during those board game hours people kept popping into the kitchen to get another scoop of this birthday cake trifle! I started the day before, by baking a Funfetti cake from a box. You need a cake, if you make one from scratch that’s great too! On the day of the party, I assembled the trifle a few hours early to give it time to meld flavors in the fridge. You could do it even a few days early, but it gets mushier/more homogeneous, which is maybe what you want but not what I wanted. I was worried about putting fruit in this trifle, but I had all that fruit that was going to go to waste, because baby decided he didn’t want berries this week, only bananas. So I mixed up my blueberries, raspberries, and blackberries and sprinkled them with a few tablespoons of sugar to macerate (aka soak/sit) while preparing everything else. 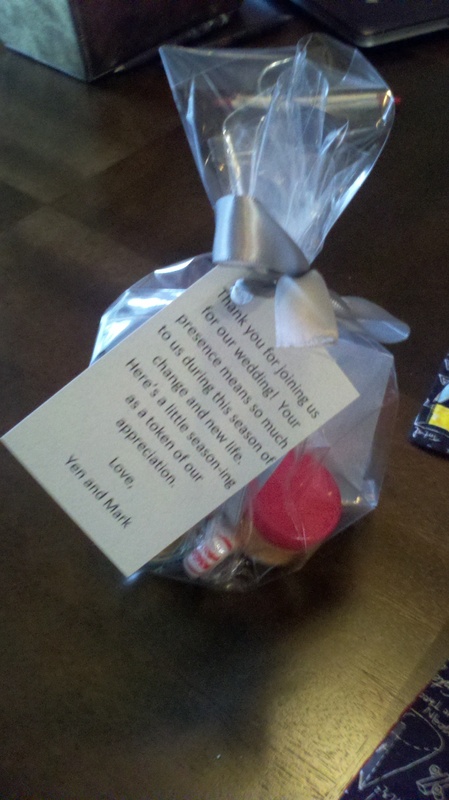 This softens and sweetens them. 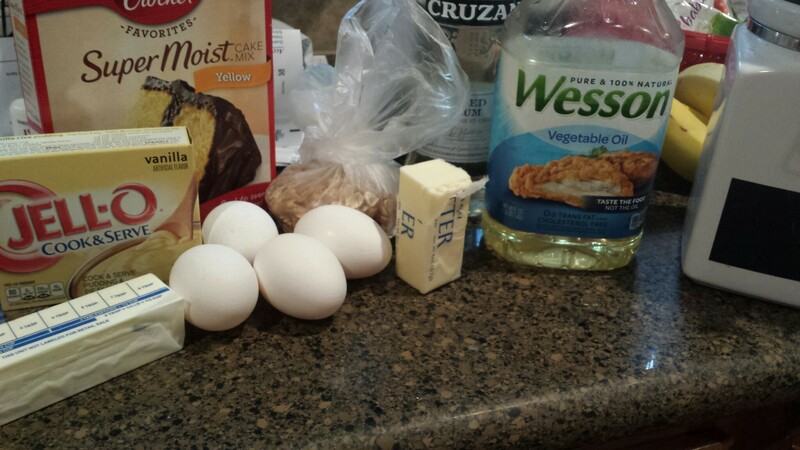 Make pudding (from scratch or I used a box). 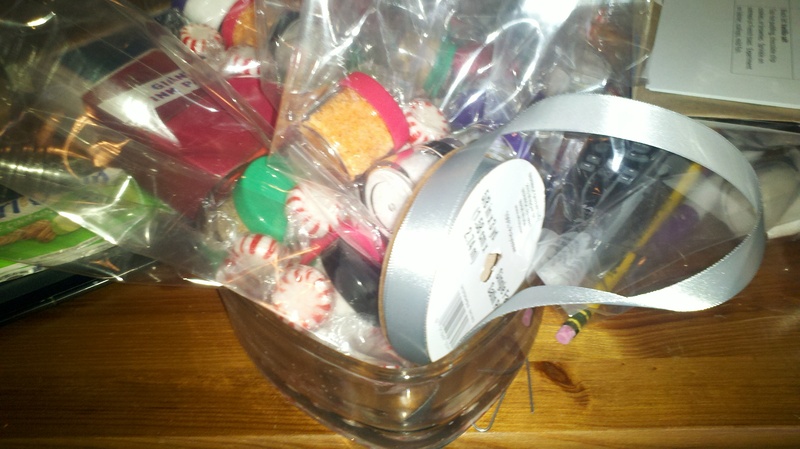 Box pudding is SO magical and easy; even my 20-month-old could do it! …sort of. Then either use cool whip/reddi whip or make your own whipped cream. If you have a stand mixer/electric mixer, homemade whipped cream is really the way to go. It’s SO DELICIOUS. 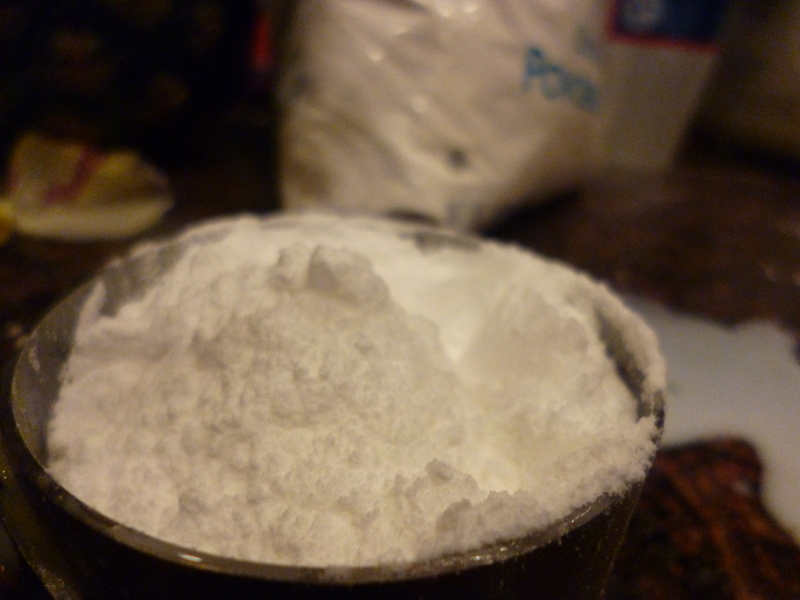 Take your cream, put it in a bowl, and start whipping it at half-power, then slowly up it to full power. 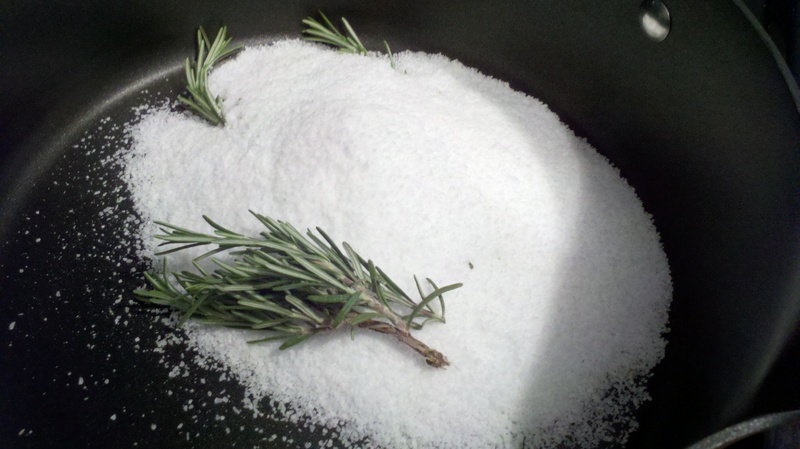 Add a few tablespoons of powdered sugar (I just tipped the bag toward it for a few seconds). If you want, add extract (vanilla, almond, etc. ), but I like it just pure and fresh and creamy and light. Stop whipping when it looks not-liquid anymore. I really hope Willow Smith loves whipped cream and sings while making it. Now gently fold the whipped cream and pudding together; this is the glue of the trifle that will eventually soak into the cake. It doesn’t have to be perfectly mixed (again, I prefer non-homogeneity in this dessert). Aladdin’s little known-talent: trifle-making. I can show you the swirl/ shining, shimmering, splendid/ tell me, princess, now when did you last let your mouth decide! Cut your cake into bite-size pieces. Trifle is awesome because you can use any flavor you want! Lemon cake would be so good here. Also angel food cake. Also chocolate cake. Any cake! Any pudding! The world is your oyster/trifle! Don’t make a trifle with oysters, please. If you want to fool someone into thinking this is healthy, say a sentence about salad, and then mention that you have some lattice (say it real fast). Take a big, beautiful glass bowl (or a trifle dish if you own one and also why do you own one?) and smear some whipped cream-pudding on the bottom. 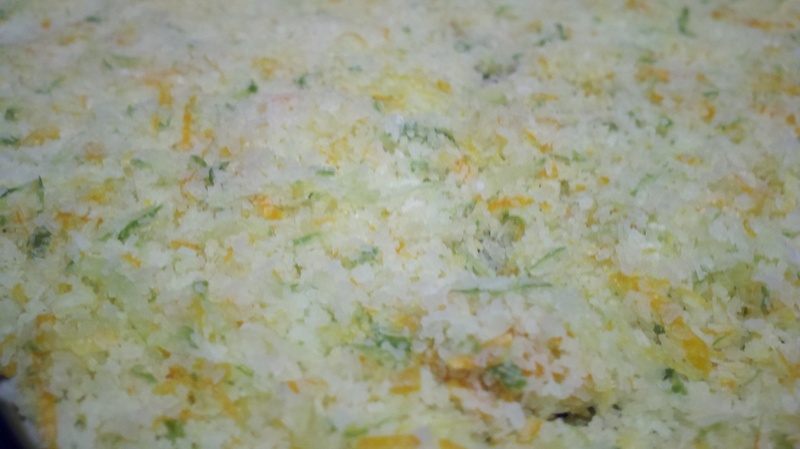 Then top it with a layer of cake-cubes. It’s for my birthday! So it’s special! A special cake-cube complex! Now top that layer of cake-cubes with another layer of pudding-cream, and top that with berries. 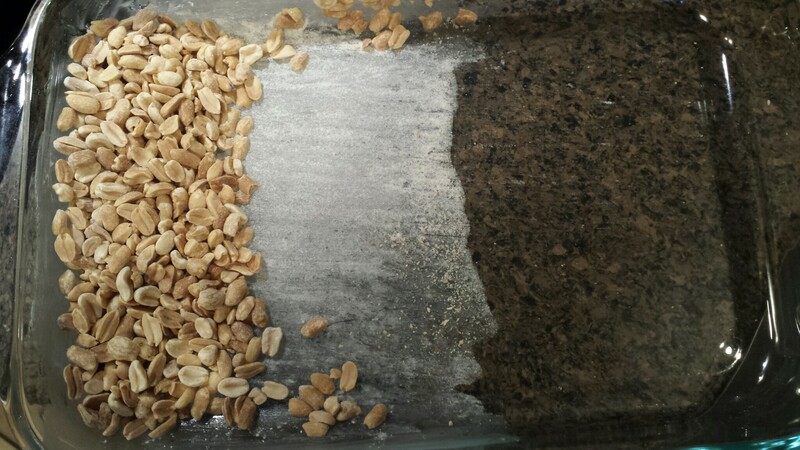 You want to go all the way to the edge of the bowl so you can see the layers from outside. Then cover that with another layer of cake-cubes, then a layer of pudding-cream, then a layer of berries, cake-cubes, and if you’re me and ran out of pudding-cream, top it all with more whipped cream! If you’re failing at something and running on an empty stomach, why not have some trifle and try full? I decorated the top with sprinkles and crumbled cake-cube. Toss in the fridge for at least an hour, and serve with a deep serving spoon. This has been a hard week for us because that adorable person up there is having some anxiety issues at daycare, and he’s only 20 months old! Poor little dude. We’re meeting with the pediatrician and the speech therapist later this week to figure out if we can do anything to help him be happier. Parenting is a thing, and I’m still new to it, and my poor baby. Anyways. That’s why this post is about trifle! Because sometimes you just need to make something delicious and easy, and it’s best if that something is light and fluffy and cloud-like too. Baking is totally therapeutic. 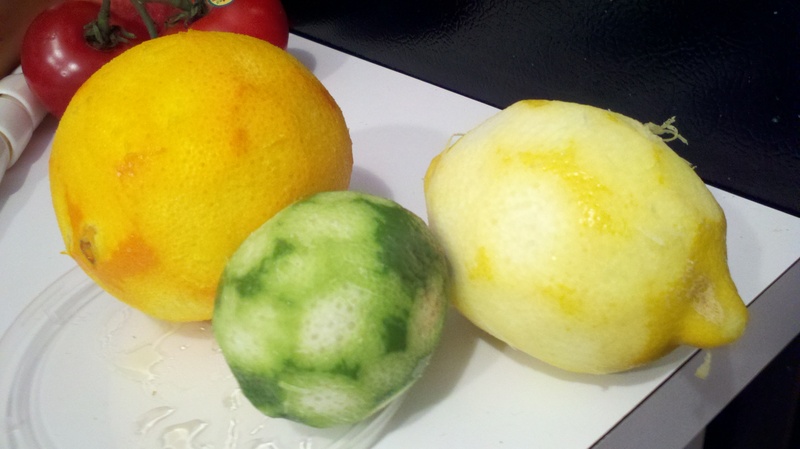 If your fruit is a bit tart, toss with the 2 TB sugar to macerate, set aside. Make the pudding according to box directions. Fresh whipped cream: beat cream with whisk attachment of mixer at 2-3 speed, then slowly increase to full speed and add powdered sugar. Beat for a few minutes, until it looks like whipped cream. 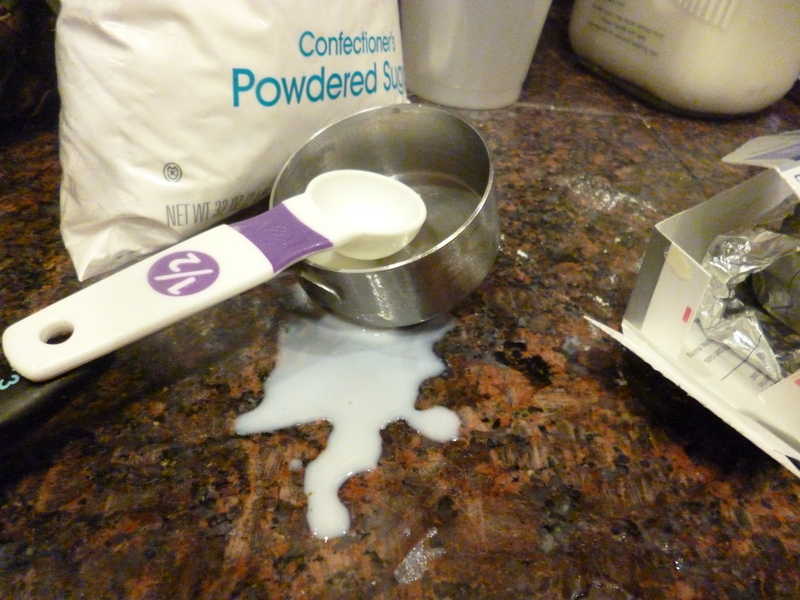 Gently fold whipped cream into pudding. Cut cake into 3/4 inch-ish squares. 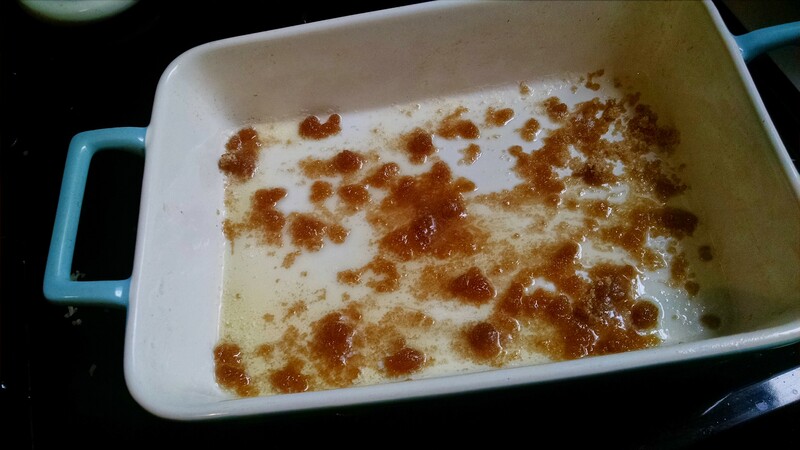 Use a big beautiful glass bowl, and smear a small amount of pudding-cream on bottom. Top with a layer of cake-cubes. 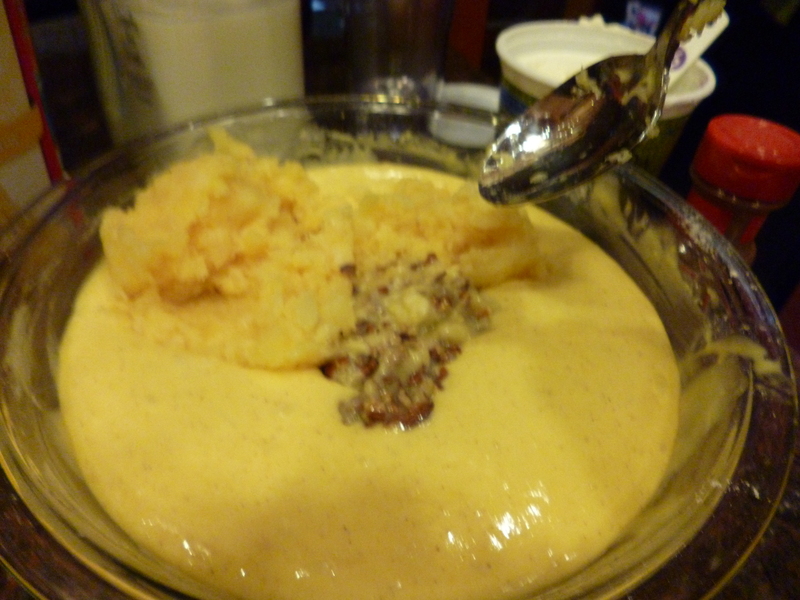 Top with a layer of pudding-cream. Then a layer of fruit. Repeat, alternating cake-cubes and fruit with pudding-cream–top layer should be pudding-cream. Decorate with cake crumbs and/or fruit. Refrigerate at least one hour. Serve cold with a spoon. I’m alive! My fingers and palm are tingling a bit as I type this, because I contracted a particularly virulent strain of hand, foot, and mouth disease from my baby (it’s not as bad as it sounds). Yesterday I had a 103.1 fever, and last week he had a 103.1 fever. I took him to the ER, I gave myself a Tylenol and a nap. It’s been mildly hectic. As I’ve said before, I’m so impressed with stay-at-home parents and I don’t know how anyone gets anything done with their kids (like, for instance, a Ph.D. thesis). Baby had a mild fever the day before his crazy one, so I kept him home with me. We went to the store, and I thought hey, it’s never too early to introduce kids to the things you love to do, so let’s bake a cake! I’ve blogged before about a super easy pineapple upside down cake, but that required some amount of measuring so I decided to just go with a box cake. Semi-homemade all the way, snobbery be damned! If Rooney Mara and Al Pacino got together and decided to combine last names, would they be the Maracinos? Also that would be gross because she is 30 and he is 75 and unrelatedly he is 5’7″. The topping is the same as for the easy-peasy amazing cinnamon buns I’ve done over and over again: put a stick of butter in a pyrex in a cold oven, and turn it on. You could definitely do this with only half a stick of butter instead; I just had a frozen stick so used the whole thing. Meanwhile, drain the pineapple rings and you’ll get just under a cup of pineapple juice. This is great, you use it to make the cake, following the box instructions and subbing juice for water. 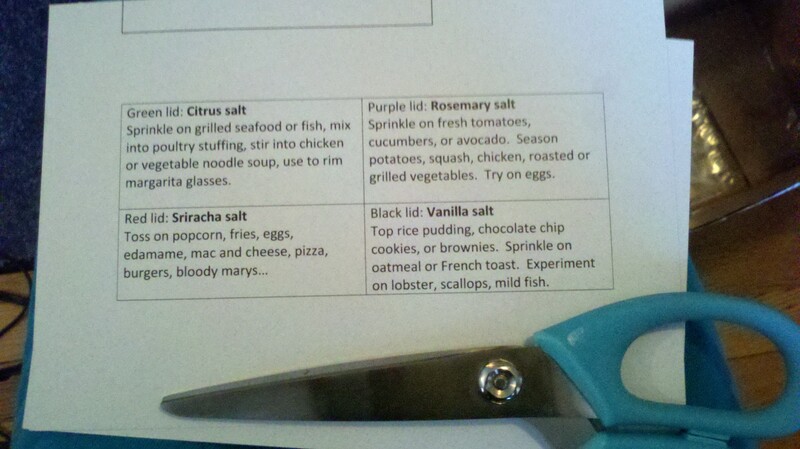 Also I’m not so great at following instructions, so I used yogurt instead of butter (I got the “butter recipe” box). Do you ever worry you won’t measure up? That even with all the eggstras you’ve added to the world, the whisks involved with you weren’t worth the benefits? I mentioned that I didn’t feel like measuring, so I didn’t, but you probably know how big half a cup is, and can eyeball about that much of full fat yogurt. (Remember, we’re using yogurt to replace butter so we need the fat). It’s important to remember that we were all once babes in the woods, and also it doesn’t matter how effective/efficient you are, but that you made an effort. If you were starting with half a stick of unfrozen butter, it’s probably melted by now. If like me you had a stick of frozen butter slowly melting in your oven, you have some time now to play patty cake or clean up or sit. Whatever floats your boat. Once the butter is all melted, take it out of the oven and sprinkle brown sugar all over it, then lay down the pineapple rings and sprinkle maraschino cherries everywhere they’ll fit. Pour on the batter. I put in about half the batter, then sprinkled it with coconut, and added the other half to cover the coconut. Bake it for 40-45 minutes, let it cool for a bit, and then invert it onto a plate. Honestly the hardest part of this cake is finding something to invert the cake onto. I ended up picking up the whole thing and putting it back into the Pyrex after, for storage. Everything will be okay, just turn that brown upside down! Even if you miss, there’ll always be an imprint of your attempts at success (I located the sticky pineapple ring and put it back on the cake, btw). 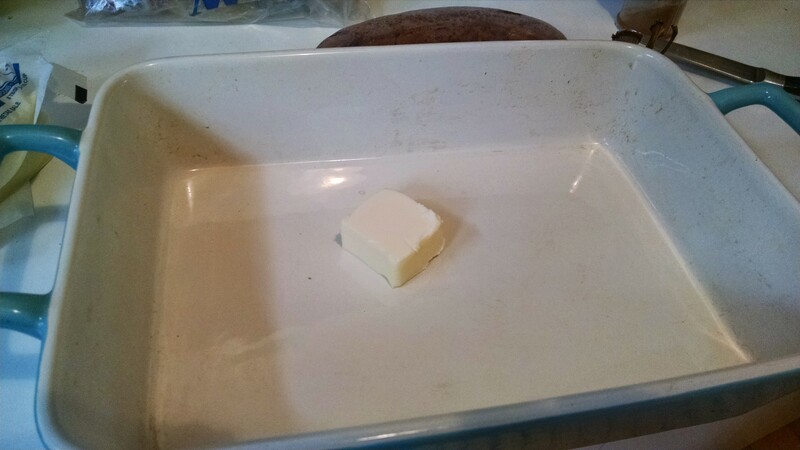 Put the butter in a 13 by 9 dish, and put it in the oven. Turn to 350. 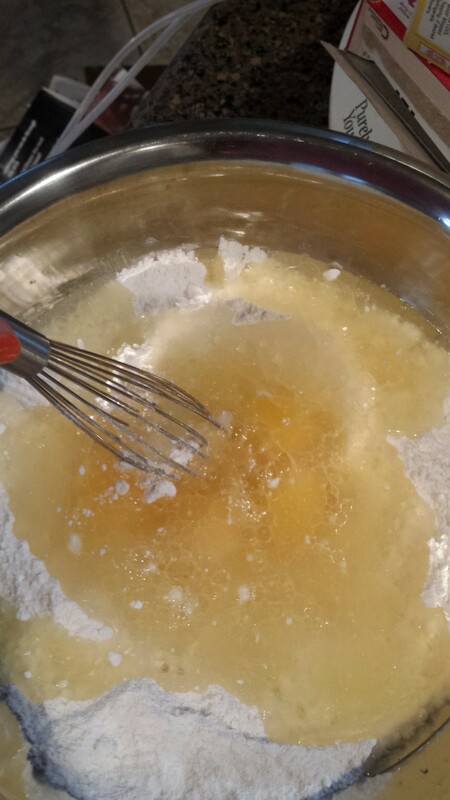 Meanwhile, mix the eggs, juice from the pineapple, cake mix, and yogurt until almost totally smooth. This is a good place for kids to help! Once the butter is melted, sprinkle the brown sugar evenly over it, then lay in the pineapple slices and put in the maraschino cherries wherever they’ll fit (take off the stems). 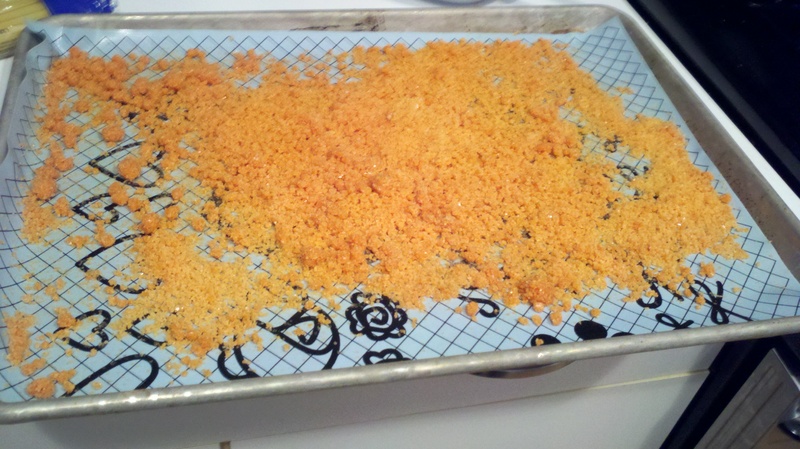 Pour half the cake batter oven the topping, then sprinkle the coconut all over it. Pour the rest of the cake batter over. Bake for 40 minutes or until brown. Let cool for 10-15 minutes, then run a knife all along the edge and invert onto a plate. Eat. Hell yes I am capable! My research is stagnant; last time I timed myself it took me 13.5 minutes to run a mile; I keep not getting the oil changed on my car. BUT I’m trying research, I am active, and my baby is still alive. AND I made a rum cake. Some days, you need pep talks from those who love you. Some days, you need to bake a cake. I didn’t have a Bundt pan (we don’t know what happened to that old one but rum cake is the only thing I make in a Bundt pan so it seems silly to buy one), so I used a 13 x 9 pyrex instead. Generously grease and flour it, then sprinkle with nuts (I used peanuts do not do that. Use pecans or walnuts). Peanuts, equality, and granite- doesn’t quite have the same ring to it as liberté, egalité, et fraternité. I guess France can keep its flag-they’d be nuts to adopt this one, even though it rocks. 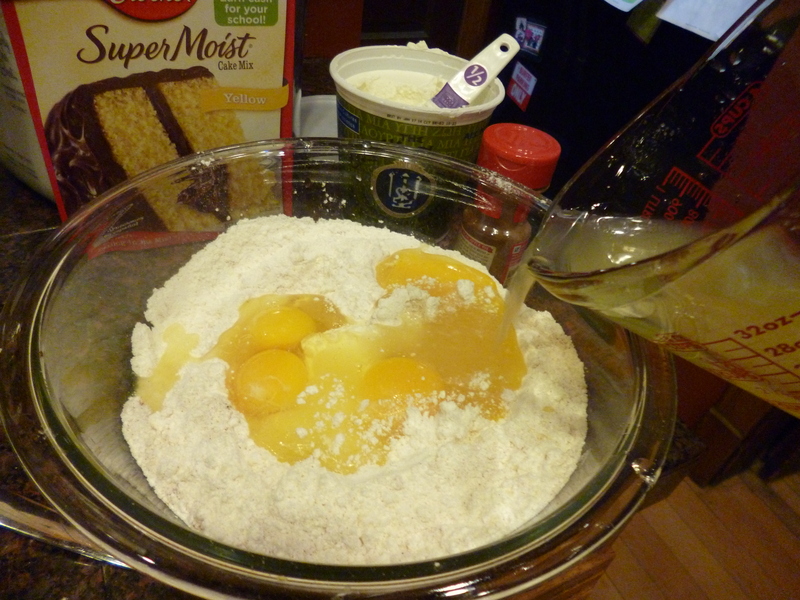 Then you make your doctored cake by adding pudding mix, an extra egg, and rum. Yum. This makes the cake a bit lighter and bouncier while somehow super moist (that’s the pudding mix). IF I PUT THINGS IN ALL CAPS YOU WILL READ THEM. 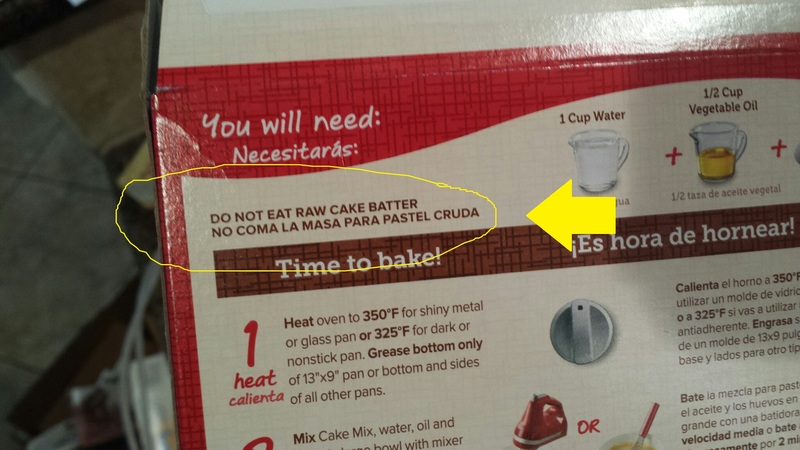 (google translate:) Si pongo COSAS EN MAYÚSCULAS USTED puedan leerlas. Breaking all the rules! That’s me! Or illiterate! O analfebetos! Anyways, while that’s baking you can doodle around the house for half an hour, then make the glaze- it’s just butter + sugar, boil it, then add rum. I ran out of white sugar so I substituted in brown for the remainder. Insert appropriate racial joke here? It’s hard because multiple ethnic groups claim “brown” which doesn’t make sense because isn’t everyone some hue of brown? I’m staring at my white husband’s skin right now to try to figure out the color. Pinky-peach but not like a sunset. He just held up a piece of paper but white people aren’t all albino. I don’t know. I’m not good with colors. That’s why I subbed in the sugar. After the butter and sugar have boiled, turn off the heat. Make sure you use a deep sided pot, not a pan, because when you add the rum things get exciting and it fizzes up. After the cake comes out of the oven, poke it all over with toothpicks or skewers, as much as you can until you get bored (so maybe 40 times?). Then drizzle half the glaze all over it. 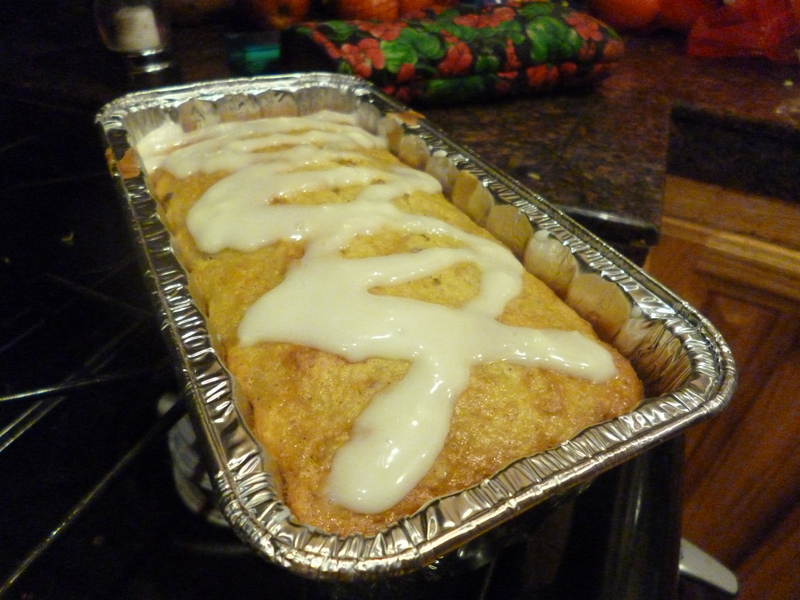 Wait a bit, invert the cake onto a plate or baking pan, and poke again + drizzle again. It’s great warm, but it’s awesome about 12 hours later, when the rum has soaked in a lot and everything is moist and rummy. 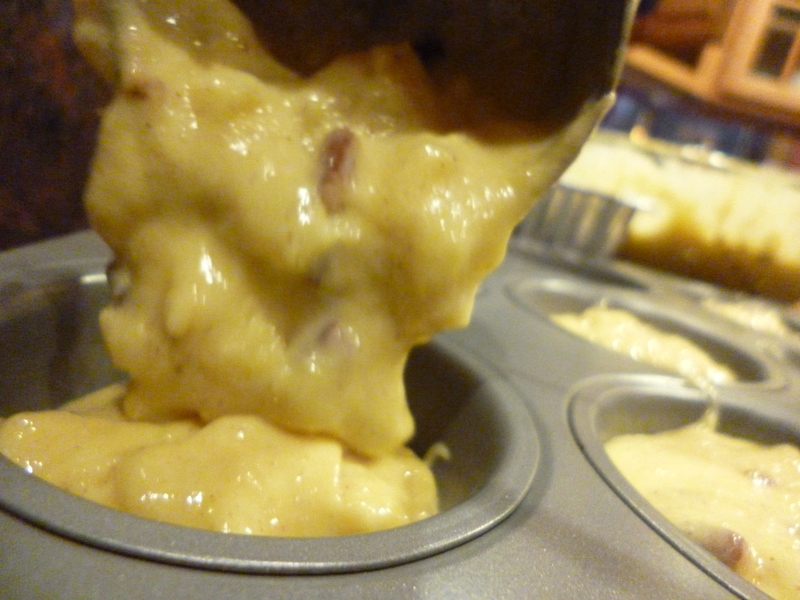 Whisk together cake mix and pudding, then add remaining cake ingredients and mix. Pour into pan, bake at 325 for one hour. 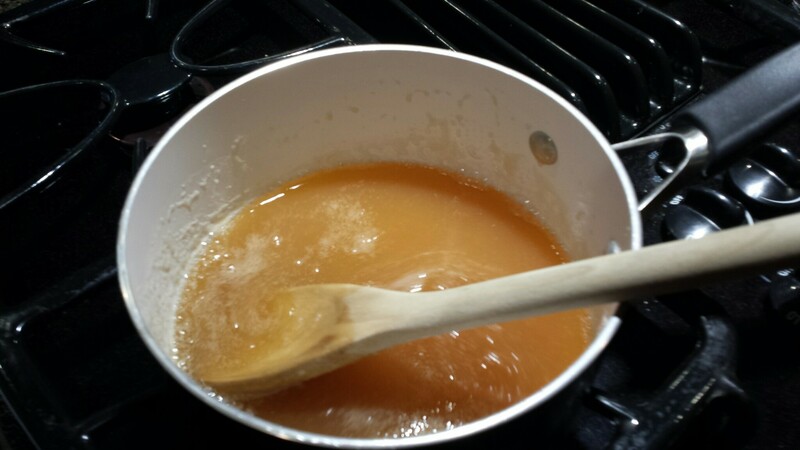 glaze part: fifteen minutes before cake is done, melt butter in a pot with sugars and water. Bring to a boil, constantly stirring. Take off the heat and stir in rum BE CAREFUL IT BUBBLES UP. When cake is done, poke holes all over it. Dribble half the glaze over it. Carefully loosen sides of the cake from pan, then cover with a serving plate and invert the cake. Poke holes all over the nutted top half, and dribble remaining glaze all over it. While I’ll always make those vegan (sometimes) pumpkin cinnamon rolls whenever I have three or four hours to wait, I now make these cinnamon buns every time I want cinnamon buns NOW (but really, within half an hour from start to finish, which is faster than going to the store to get them). I’ve had this recipe for about three months and have made these at least six times- they were the first thing I baked after baby was born! They were also the second thing I baked after baby was born. And possibly the third. No matter how many people you have eating these, they’ll be gone very quickly. I think four is a great number, so everyone gets to have two and maybe wishes they had more. But three is also wonderful, because eating three of these is wonderful. Honestly I could eat all eight that come in a batch by myself. What I’m saying is THESE ARE SO GOOD GO BUY SOME CRESCENT ROLL DOUGH AND MAKE THEM NOW. They’re so good that I didn’t take a picture of all the ingredients beforehand. If you bake at all you already have all of these minus the crescent roll dough. First put a pat of butter in a smallish casserole dish or pie pan, and stick it in the cold oven. Turn the oven to 350. I love when stuff goes in a cold oven, so you aren’t wasting gas by preheating. Anyways. 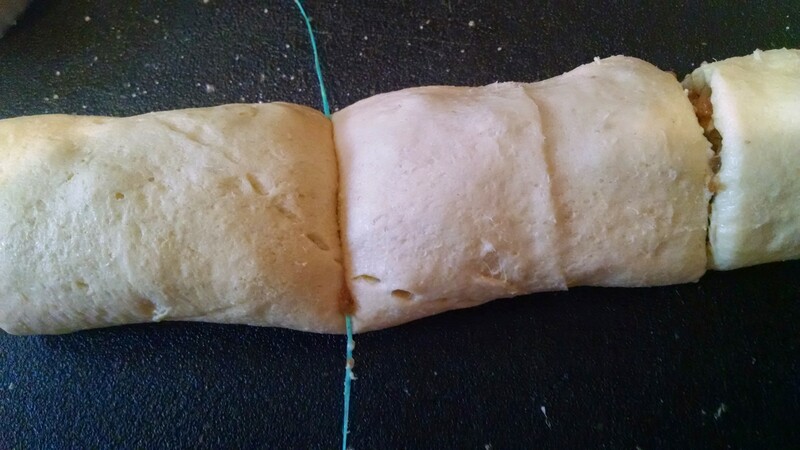 Open your can of crescent roll dough (this was not intuitive to me and it took me awhile and I still think I do it wrong), and spread out the dough. 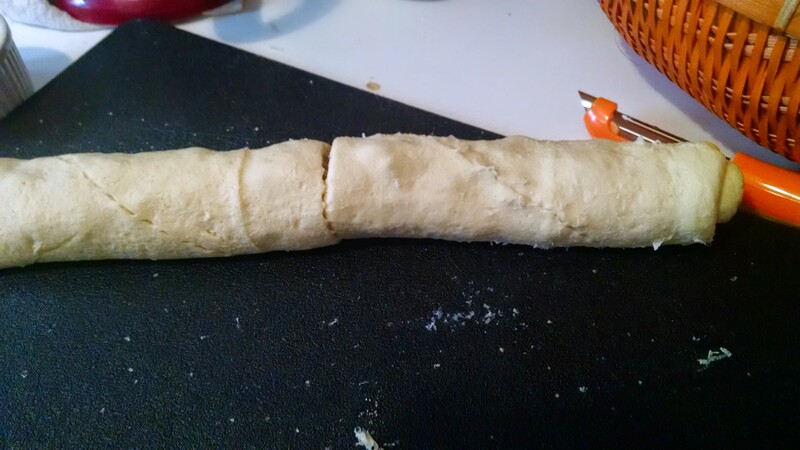 Pinch together the edges so you have one big rectangle of dough. It’s OK if it’s not perfect; pinching just makes it easier to cut the buns. Now stick another two tablespoons of butter in the microwave for 15 seconds (or if you’re one of those people who leave butter out, just take that softened butter. I think I’ll start leaving butter out. It’s so convenient!) 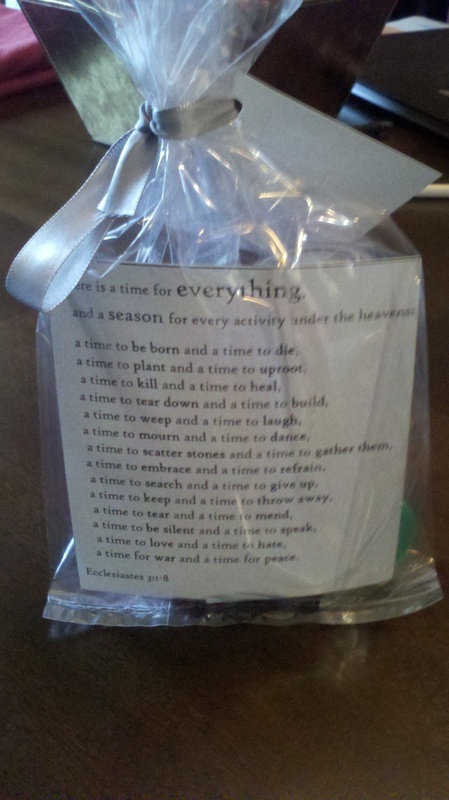 and spread it on the dough. 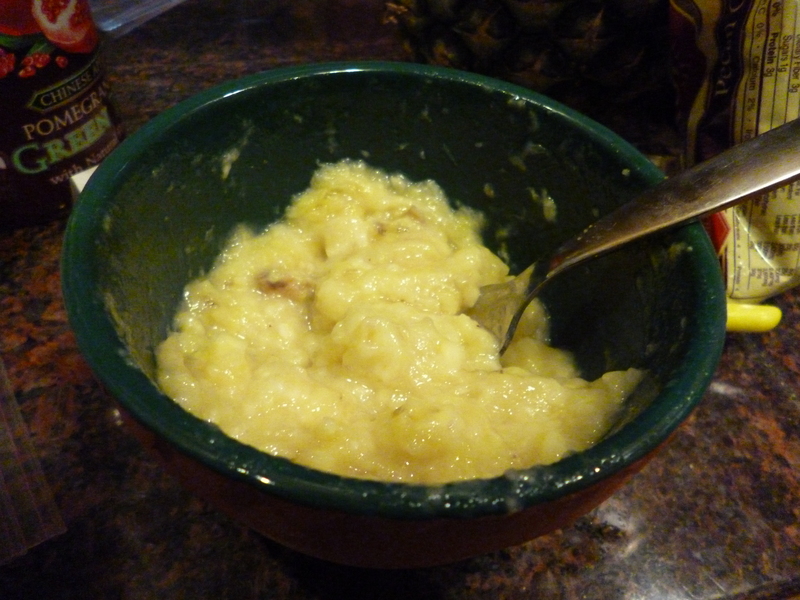 Mash or slice a banana and spread it on top of the butter. I’ve done it both ways and I think I prefer eating the mashed banana, but slicing is SO EASY. 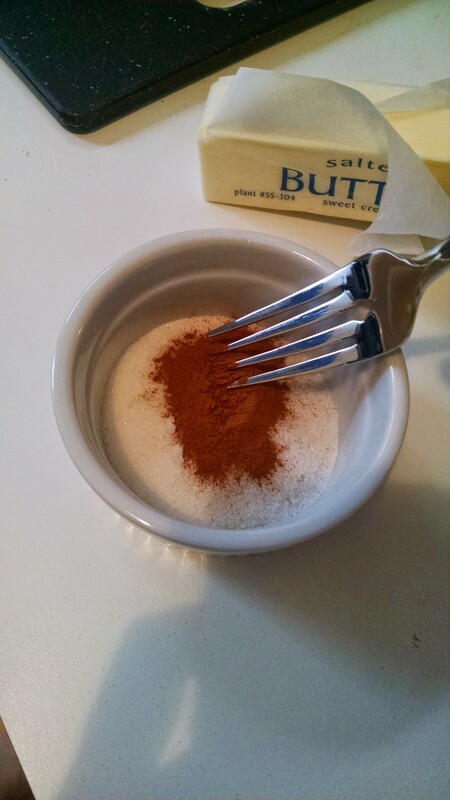 Then mix some cinnamon into some sugar and sprinkle it over the whole thing. Now take the long edge and fold up an inch. Roll up the whole thing this way (so you’re traveling a shorter distance and holding the longer side). Taking a break from court- check out this natural log! It rules! Sometimes it was hard to cut between the lines and figure out what actually happened. Now pull that casserole dish out of the oven- the butter should be nice and melted now. 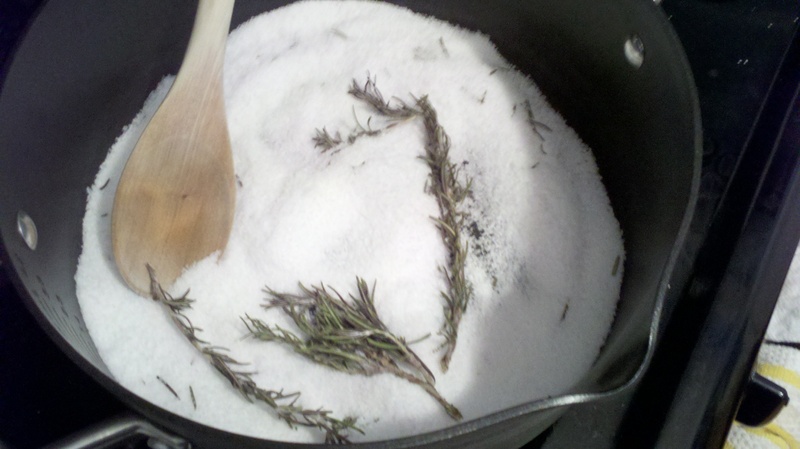 Spread it around, and sprinkle with two tablespoons of brown sugar. This was just a small civil case, not like Brown vs. Butter of Education. Oh it was Board of Education, huh. Mixed it up in mind for some reason. Now put the rolls, spiral side down, in the pan. They’ll be a few inches apart, which is fine- they’ll spread into deliciousness. 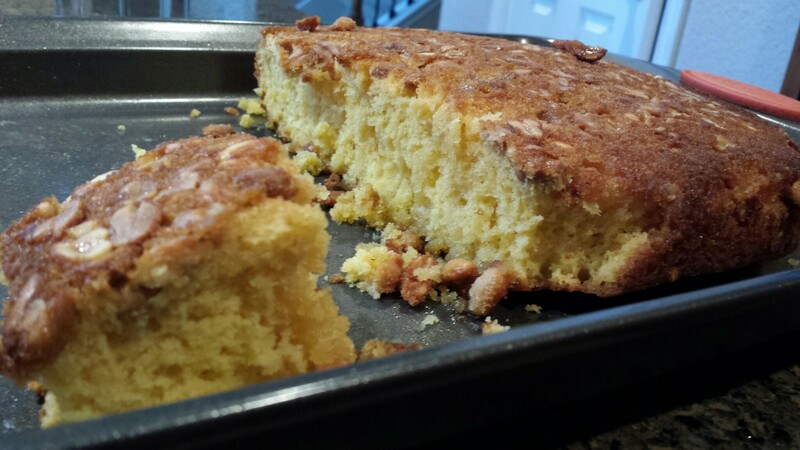 This brown sugar-butter combination on the bottom makes a crust similar to pineapple upside down cake. It’s awesome. I love these plain, but you can also glaze them (powdered sugar + milk + vanilla) or frost them (cream cheese + powdered sugar + milk +vanilla). I prefer the cream cheese and will include that below. It was hard to look at the plaintiff when we returned the verdict in favor of the defendant- there was no way to sugar coat it. Cut two tablespoons of the butter into a pie pan or a small casserole dish. Place into the oven and set oven to 350. 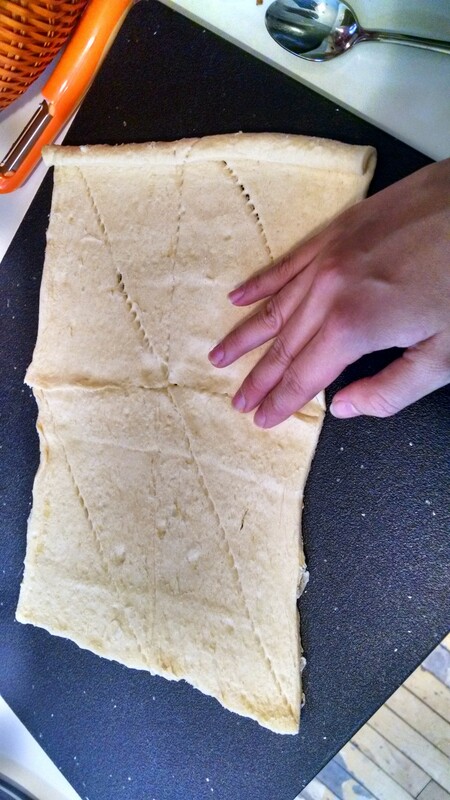 Spread out the crescent roll dough, pinching seams together. Soften remaining two tablespoons of butter (microwave 15 seconds) and spread on dough. Either mash banana and spread atop butter, or slice and lay in lines across the dough (like an American flag). 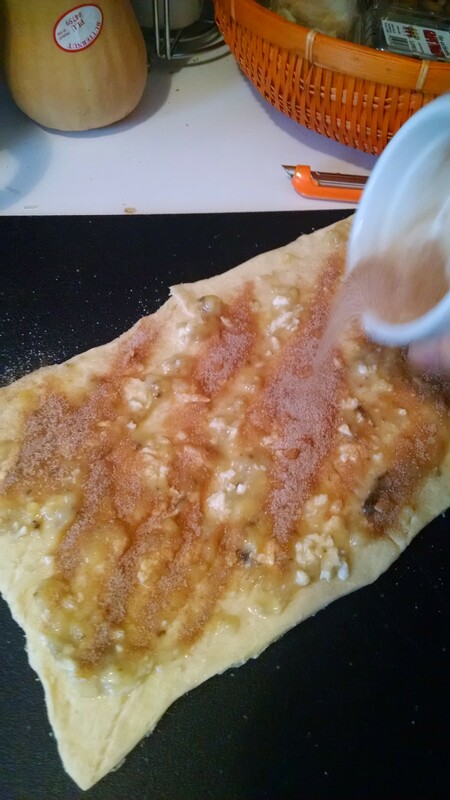 Mix white sugar and cinnamon, then sprinkle over the dough. 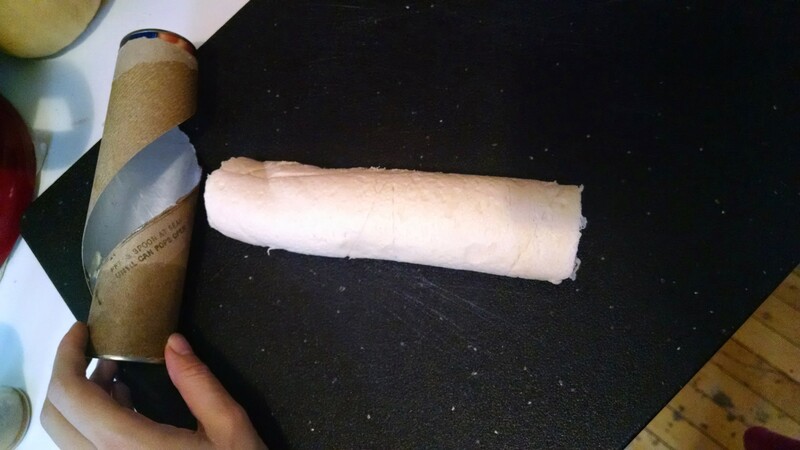 Roll up dough into a log. Cut into eight slices. Remove warm pan from oven. 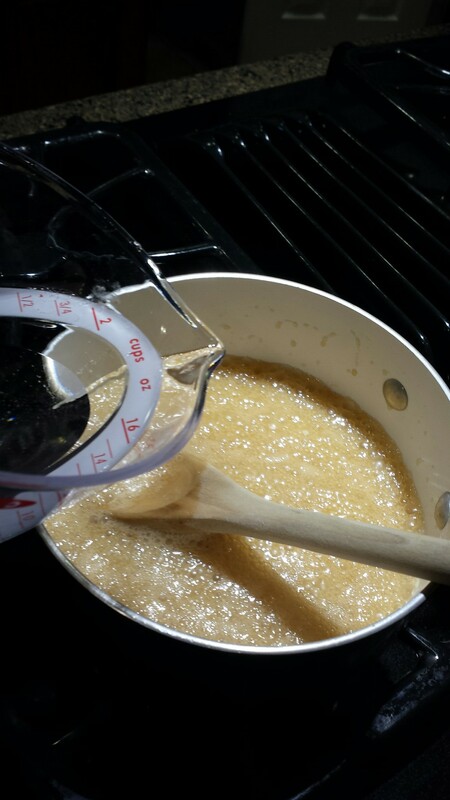 Sprinkle with brown sugar. Place slices spiral side down onto the butter-sugar. Bake for 20 minutes, until golden brown. 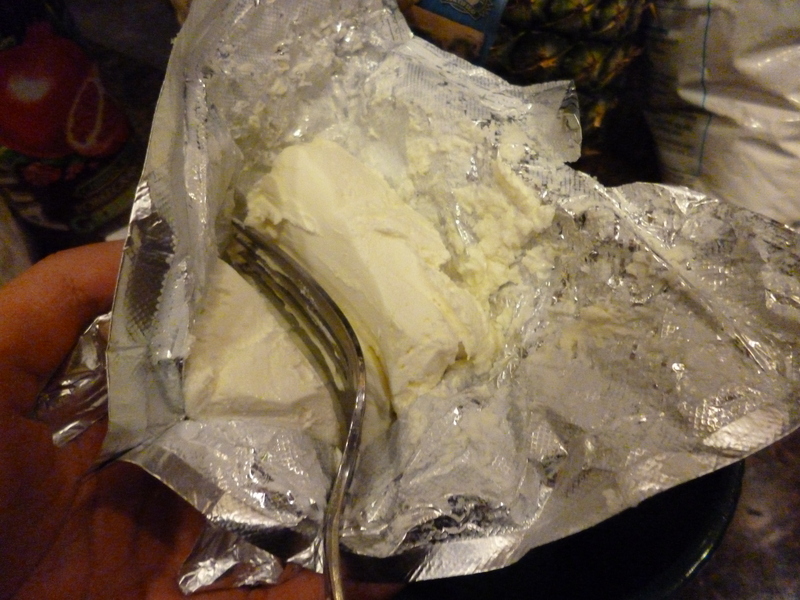 (Optional): Soften the cream cheese (microwave for 15 seconds), then mash with a fork. Add in powdered sugar, milk, and vanilla, and mash until you have a thick frosting. Plop some onto each warm cinnamon roll. Devour. Last Christmas was the first time I met a lot of my fiance’s extended family, and I wanted to make a good impression, so I brought one of those delicious fruitcakes from my very first blog post. Turns out people don’t like fruitcake much (why?! It’s SO GOOD!!!). This year I brought a loaf of hummingbird cake, which is essentially banana-pineapple cake with some nuts. Turns out you should refrigerate it, so keep that in mind if you make this. It is still quite tasty and moist, though not as good as the fruitcake (but not nearly as labor and time-intensive). 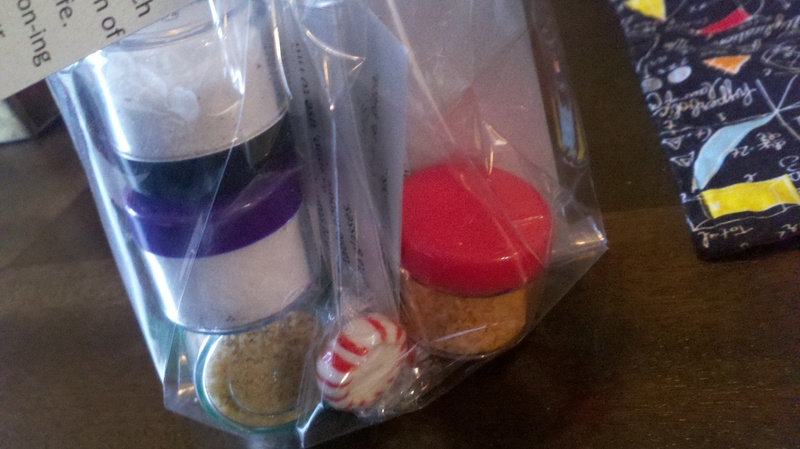 I don’t have my Ph.D. yet, but you could still call me doctor for doctoring this cake mix! The bananas look a little beat up in the picture above, but they aren’t actually that ripe. So I cheated and threw them in the oven to roast to get a riper flavor. We’re GOING (roasted) BANANAS IN HERE! Another reason this was not time-intensive: it’s semi-homemade! I used a box of “supermoist” yellow cake mix instead of measuring out flour etc. I didn’t have instant pudding on hand (the only time I can recall buying instant pudding was in the future, for my barely-semi-homemade banana pudding), so I subbed in some powdered sugar and vanilla. 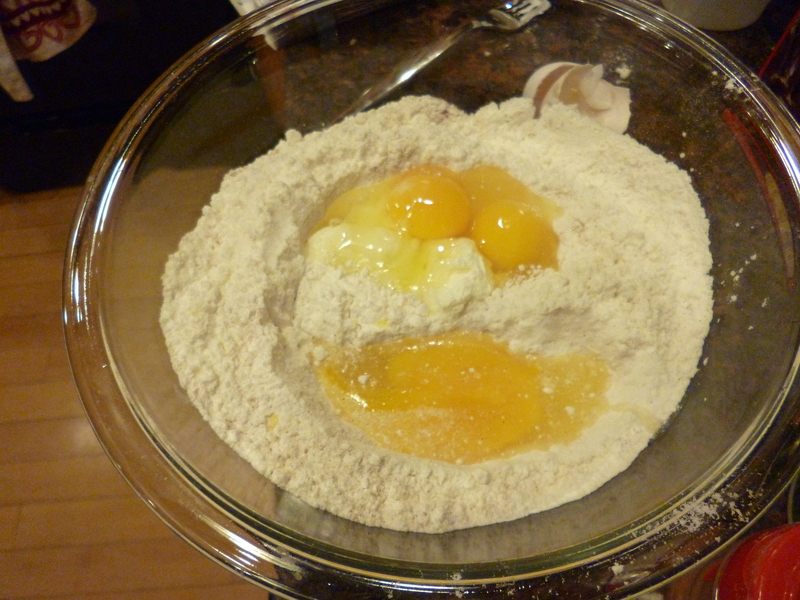 Mixed in some cinnamon, then made a little yolk-y picture. If John Travolta and Nicolas Cage were in my kitchen, I bet they’d race to pull the eggs out of this bowl. It’d be a Face/Off. This all happened while the bananas were roasting. 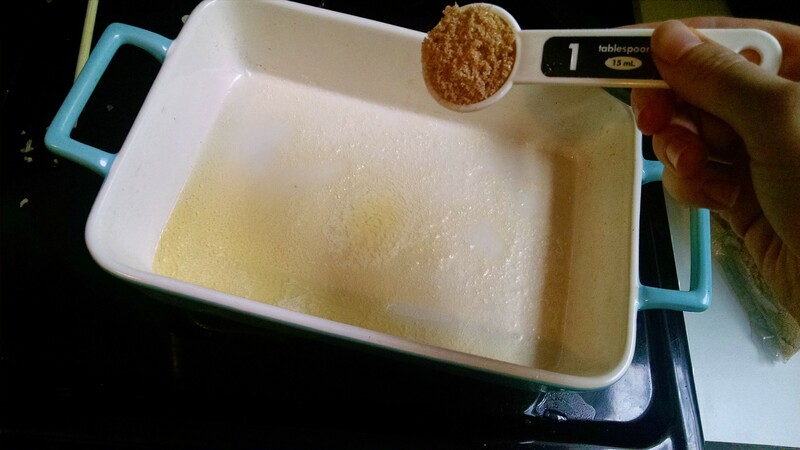 I also drained a can of crushed pineapple, so I could put the juice into the egg-cake mix-sugar batter. Our dog was standing in the kitchen and looking at this and kept saying “fruit roof!” But since he’s a dog, we thought he was saying “Fruit Loops!” and gave him a handful of cereal. That story is ridiculous. You know we have two cats, we certainly couldn’t also fit a dog in the apartment. Much less a talking one. While the iced teas are popular, sometimes Snapple likes to make wacky promotional flavors, like pie. Pie Snapple, however, was a dud, and Mr. S. decided to pull out his support. Pi-napple was a huge hit! Once those are mixed with the yogurt, you can mash the bananas. 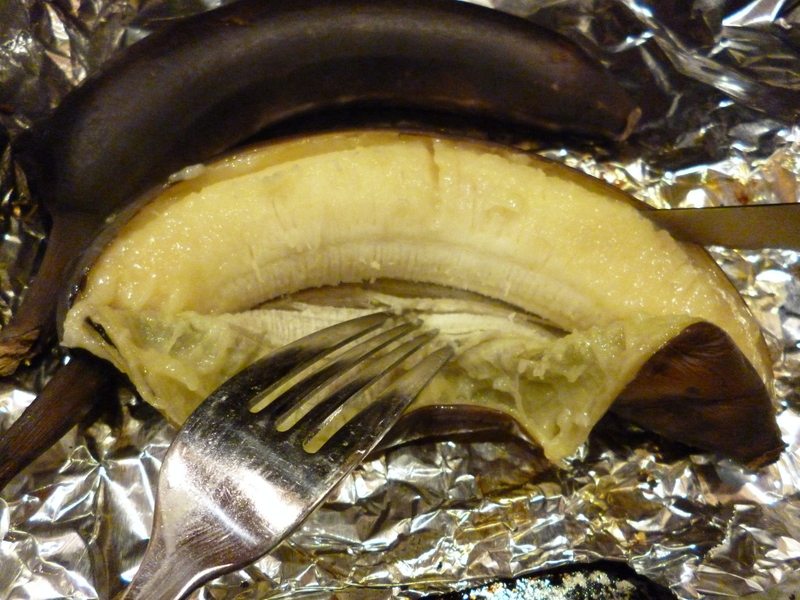 I love doing this with super ripe bananas because they yield so easily under your fork! Also, I appear to use banana a LOT when baking (I love bananas!) 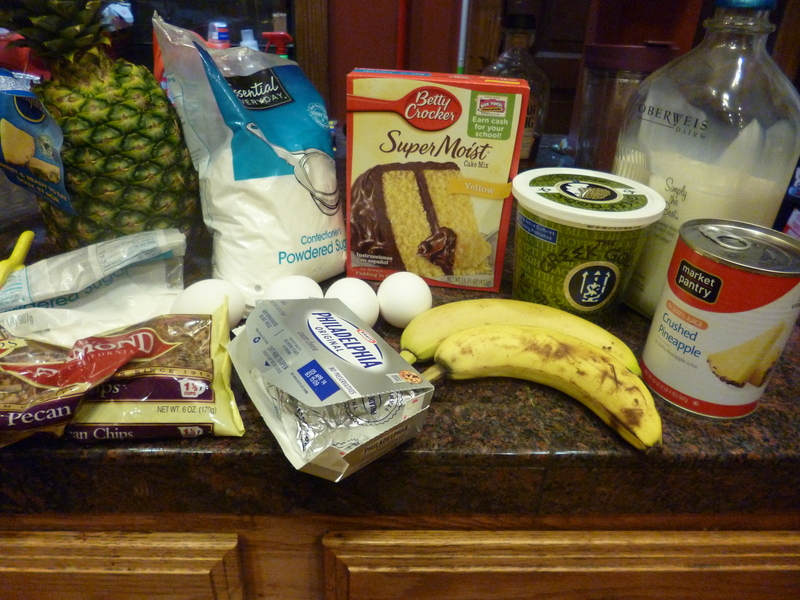 Mix in the pecans and pineapple with the banana, and then mix those with the cake mix. This guy used to mix up letters and numbers. So when his girlfriend asked him to pick up some home decor items at this one store, he was very confused to find himself at a historic pier. Though he messed up in that direction, he’d never do the converse: for instance, look at this bowl and say it’s a pur-one. Batter batter batter SWING! Actually don’t, please, you’ll get cake all over the floor. I initially meant to make this time and labor-intensive cake (just how labor-intensive? You crush the pineapple by hand instead of buying the can), but went with these little muffins and a mini-loaf instead. No pun: I suddenly wonder why they don’t sell cake batter the way they sell cookie dough: just pour and bake. It seems like something people might use… maybe not. If you’re talented/pinterest-y, you can make a pretty drizzle. 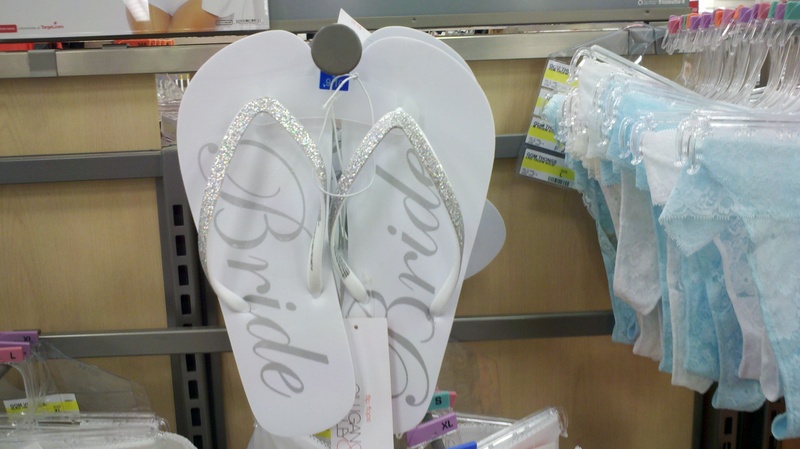 If you’re me, just chuck it on. 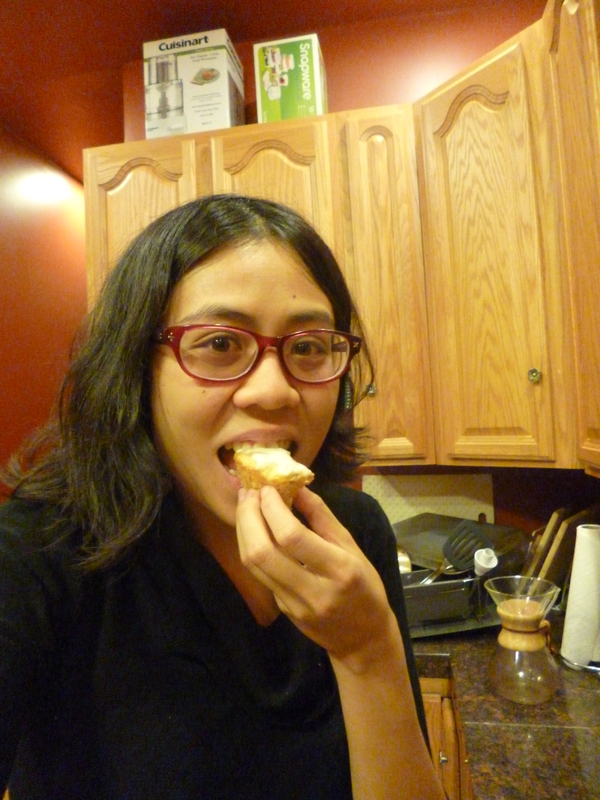 It’s been a little while since we’ve had a picture of me eating, so here’s one! 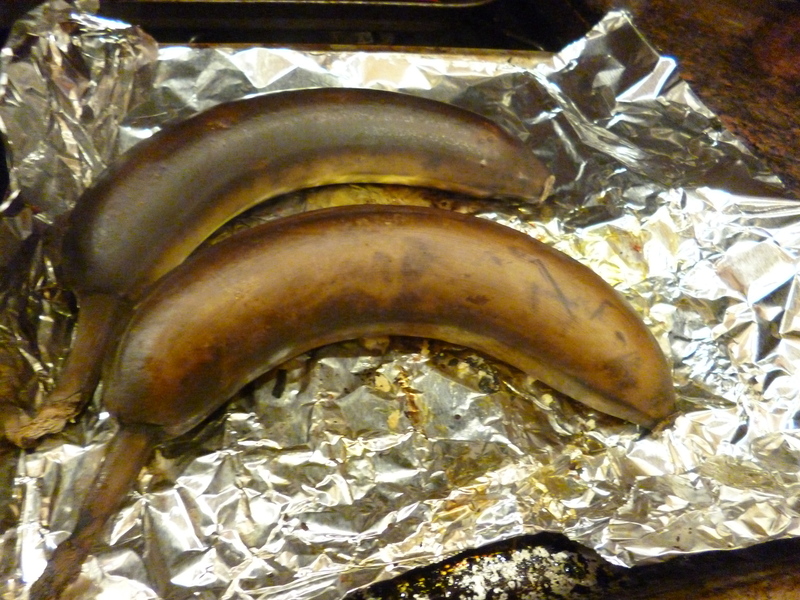 First, roast the bananas: put on a cookie sheet, in their peels, and throw in the oven. Set oven to 350. Drain pineapple, reserving 1 c juice. Mix cake mix, 3/4 c powdered sugar, cinnamon. 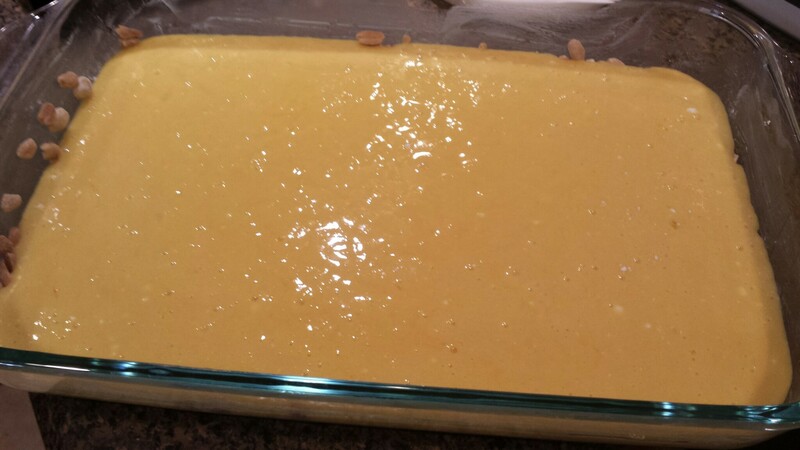 Mix in eggs, pineapple juice, yogurt until smooth. 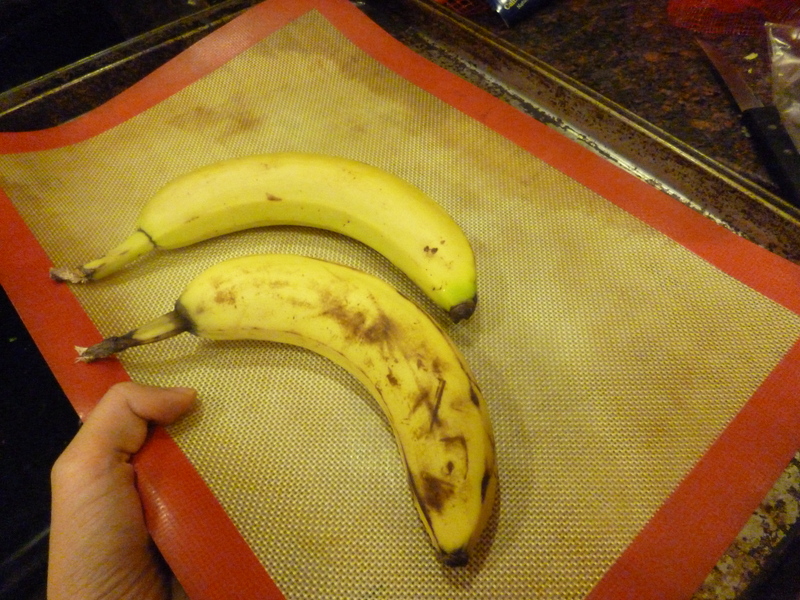 Remove bananas from oven. Peels will hopefully be black by now (about 10 minutes). 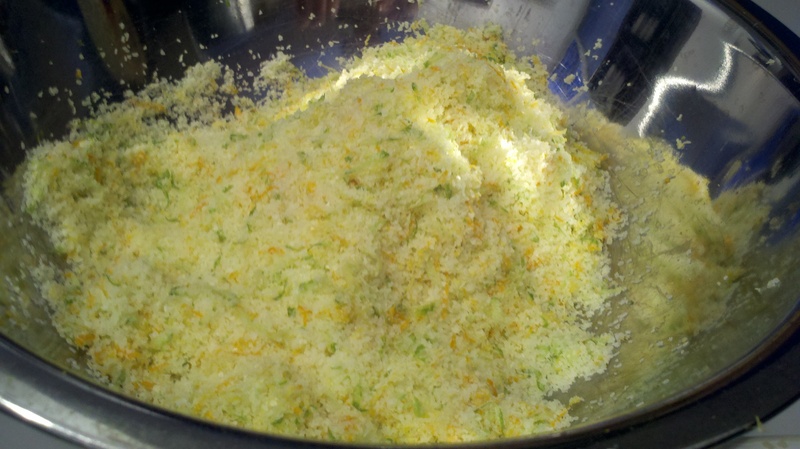 Carefully peel, then mash. 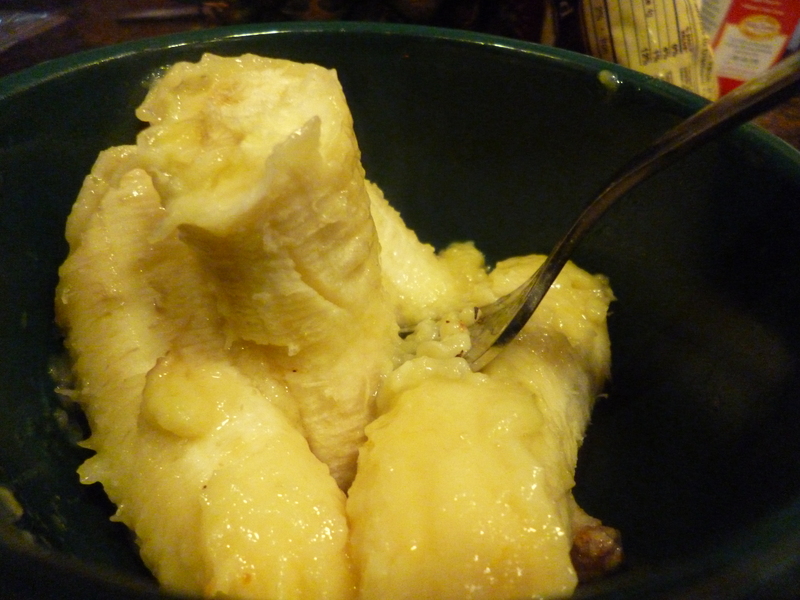 Add pecans and pineapple to bananas, then fold the mixture into the cake mix. 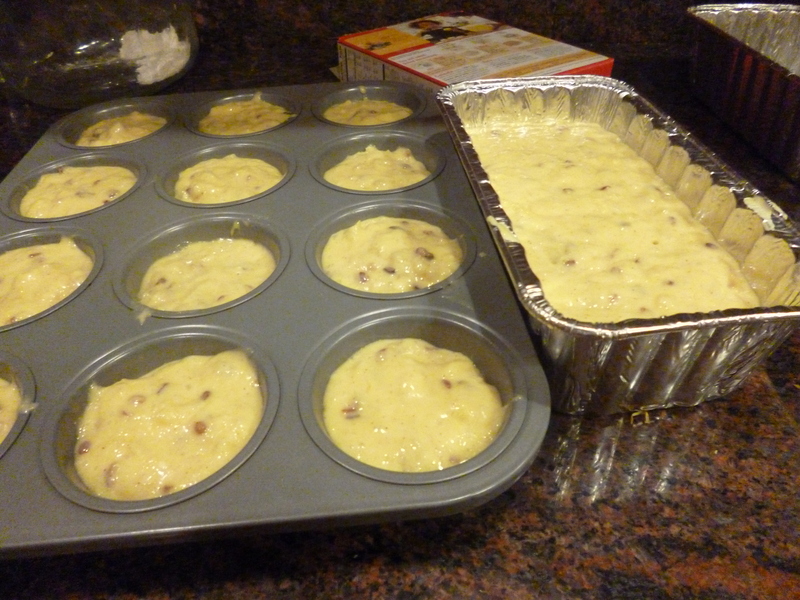 Pour into greased mini loaf pans or muffin tins (I made 12 muffins + 1 loaf out of this). Bake in that 350 oven for 30 minutes, check the muffins. If toothpick comes out clean, they’re done. Loaf should be done around 40 minutes. While they cool, smash cream cheese with remaining 1/2 c powdered sugar and milk until smooth. 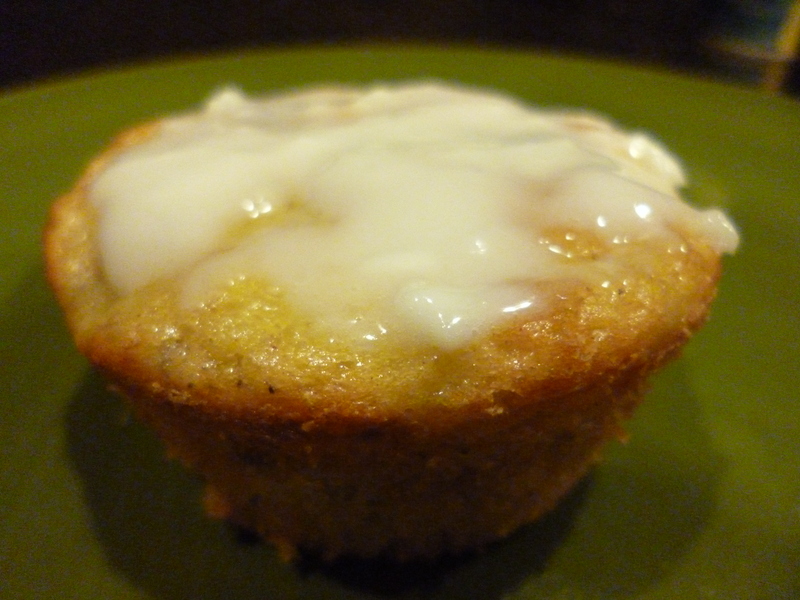 Drizzle icing over loaves/muffins. Store in fridge if they last more than two days.